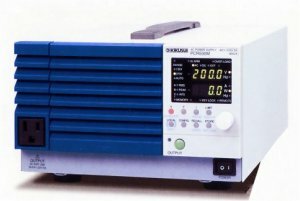 The Kikusui PCR500M is a compact, multi functional AC power supply that employs the Pulse Width Modulation (PWM) inverter method. Lighter and more compact than its predecessor units, it provides users with a highly efficient and productive solution. It offers precise measurement capability, an advanced protection set, multiple memory features, and a variety of communication interface options. Its also capable of providing DC power. This quality power supply supports an analog interface board making it possible for operators to use PCR500M as a signal generator booster. EX04-PCR-M is an optional board that is incorporated in the power supply, allowing technicians to use this device for boosting signal generators. The compact design of PCR500M makes it possible for use in many various limited space environments. The profile is compact, easy to carry, and weighs only 6 kg. Unlike many conventional power supplies, the Kikusui PCR500M offers versatile output modes making it useful for a broad range of applications. The three modes that it offers are: AC, DC, and AC+DC. It works in a wide frequency range of up to 500Hz. Its powerful memory feature allows for storage and recall of up to three combinations of voltage and frequency settings. Technicians are able to read and test sudden changes in frequency or voltage by calling memory during output. The Kikusui PCR500M offers a variety of measurement features. Operators can use the power supply for the measurement of current, voltage, AC power output, DC power output, power factor, reactive power, apparent power, current peak hold, and crest factor. The power supply also has a variety of communication interface options including RS-232C, GPIB, and USB. The GPIB and USB interfaces are optional , and RS-232C comes as standard. In the AC mode, the power supply gives a voltage output varying between 1V and 135V. It can also be switched to vary between 2V and 270V. A user can switch the available two ranges either manually or automatically. For the 135-V range, the maximum current is 5A, and the maximum current is 2.5A for the 270-V range. The PCR500M is also an ideal power supply for ships and aircrafts that require 400Hz, and is also suitable for use in driving actuators that need 250 Hz. In DC mode, the output of Kikusui PCR500M ranges between 2.8V and 380V or 1.4V and 190V. Just like in the AC mode, users can switch between the two available ranges either automatically or manually. For the 135-V range, a 4A maximum current is achieved. In the case of 270-V range, the maximum current is 2A. The input power supply of PCR500M is 100V to 120V (AC) or 200V to 240V (AC) at 50/60 Hz. For computer control, the PCR-M series models come standard with advanced control software. 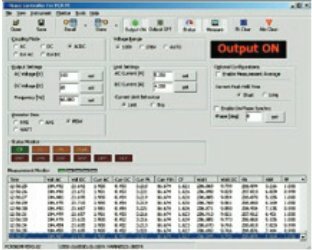 The software allows the technician to log measurement values of output as well as adjust individual parameters. Other advanced features include setting limit values, controlling output voltage, current and frequency, and setting limit values. This entry was posted in Site News and tagged Kikusui PCR500M. Bookmark the permalink.